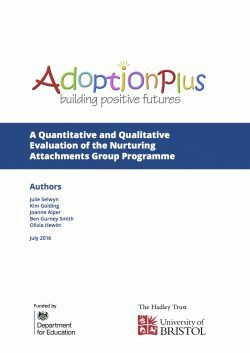 The UK Government’s Department for Education funded Adoptionplus to carry out an evaluation of the Nurturing Attachments groupwork programme developed by Kim Golding. The results of this qualitative and quantitive study were presented at Woburn Abbey on 29th September 2016. This study provides evidence that the Nurturing Attachments Group is an effective intervention for supporting adoptive parents. Parents are left with increased understanding, a new perception of their children, parenting skills which they will continue to develop and increased hope for the future. For some parents this can represent a turning point in their adoption journey. It is anticipated that if these gains can be sustained the children will increase in security over time, although the support needs of these families should not be underestimated. A six-month group experience is a good start to providing the support and understanding parents need to parent these children in a way which will help them to heal from their trauma. It is likely, however, that they will also need ongoing support alongside therapeutic help for the children during their adoption journey. Kim suggests that the Nurturing Attachments Group is just the beginning of providing the help and support needed if adopted children are to grow up feeling more secure and with their potential fulfilled. The full report can be found in the DDP Library or via the Adoptionplus website. Kim will be presenting these results at the 2016 International DDP Conference, 10th-11th October, in Glasgow, Scotland.